Just before Christmas we were sent an Electric Jukebox to try out. 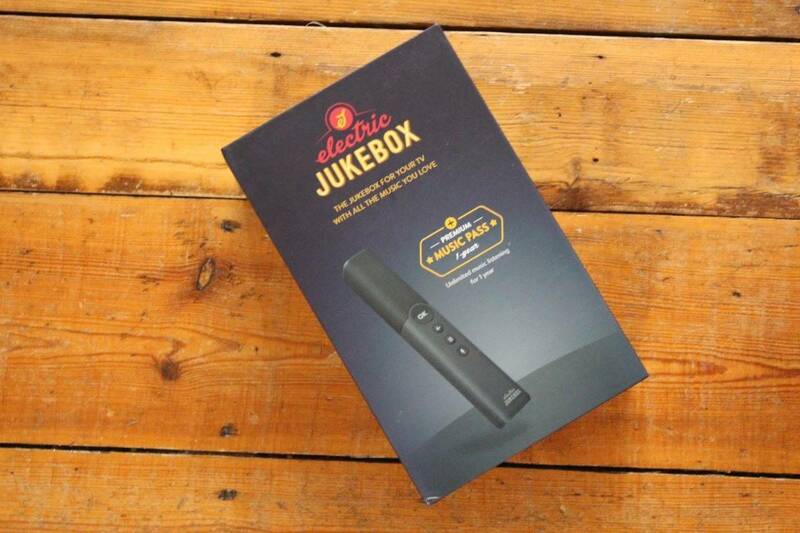 The Electric Jukebox is a streaming music service for your TV. 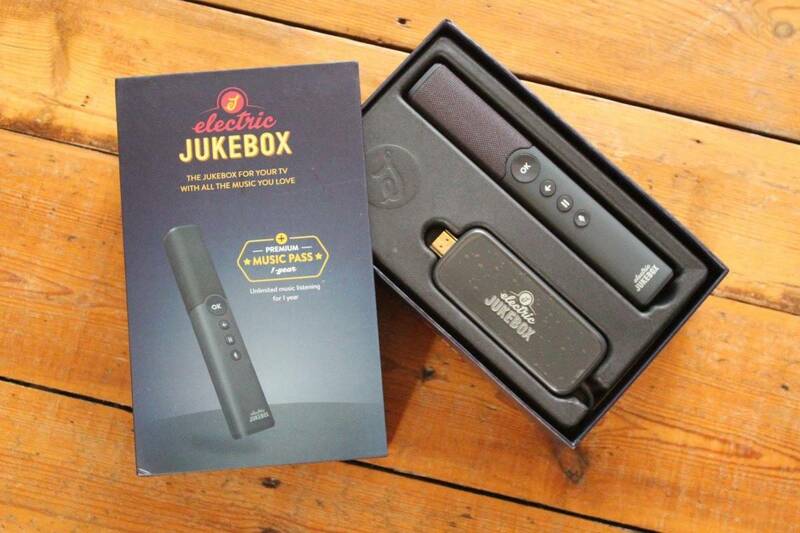 In the pack you get the Electric Jukebox dongle that you plug in to your TV via an HDMI port, a small HDMI extension lead and a microphone remote controller. Yes, you read that correctly! Once plugged in, the setup process is very straight forward. You can either press the WPS button on your WiFi router or you can enter the password manually during the on screen prompts. When the setup is complete, you will instantly have access to over twenty nine million songs to stream! The only cost is the initial outlay for the pack, currently £169. This will give you 12 months access and after that you will need to pay £52 per year to keep up the premium service. The premium service includes on-demand search and play, curated music channels, charts and celebrity mix-tapes with no adverts. The regular free service features adverts and no on demand content, just existing charts and music channels. Back to the microphone controller. Sadly, this isn’t for a hidden karaoke feature. It is in fact for voice activation of the Electric Jukebox software. After pressing the button on the remote, you can simply say the artist or name of a track that you want to listen to. The Electric Jukebox will then show you what it heard and start the search. Most of the time the voice recognition is very successful but it can mishear you and give you something unexpected! You can then point the remote at the screen to scroll through and then select your chosen track. The search facility will also give your recordings of your favourite songs by cover artists, so you need to be sure that you’re going to play your intended version. You may have to skip the first few results to find the original artist. Having used the Electric Jukebox over the festive period, it has provided plenty of classic christmassy playlists with suitable background music for family activities as well as up to date chart songs for playing when the kids were in bed. I can’t help but think that the Electric Jukebox is a little pricey compared to other streaming music services. Other popular streaming services are available for about ten pound a month and seem to be more user friendly. For example, with Electric Jukebox you can’t listen offline and you are limited to your TV as the source. You can’t listen on your smartphone or tablet. I also found the remote control a bit ropey with it’s point and aim selection process. It felt as if I was pointing the control to the other side of the room to select something on the screen! I can’t work out why the Electric Jukebox actually needs the dongle in the TV or the remote, when a downloadable app for your smart TV would appear to do the job perfectly well, without the cost of additional hardware. Electric Jukebox is a great idea and for someone without a smart TV or access to any other streaming services it could be a great investment. But with so many alternative options available I can’t help but feel that Electric Jukebox has too much competition at a more affordable price. Disclosure: We were sent the above product for the purpose of this review however all opinions are my own. Oh dear it doesn’t sound like the greatest product ever! My husband came home raving about something similar the other day that he’d seen at someone’s house but I’ll make sure we shop around before investing in anything. I think we need a whole new TV unfortunately so we might get something like this at the same time.